Evergreen trees at the edge of Alaska’s tundra are growing faster, suggesting that at least some forests may be adapting to a rapidly warming climate, says a new study. 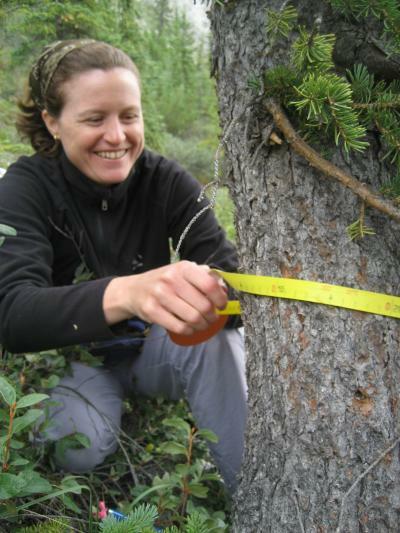 While forests elsewhere are thinning from wildfires, insect damage and droughts partially attributed to global warming, some white spruce trees in the far north of Alaska have grown more vigorously in the last hundred years, especially since 1950, the study has found. The health of forests globally is gaining attention, because trees are thought to absorb a third of all industrial carbon emissions, transferring carbon dioxide into soil and wood. The study, in the journal Environmental Research Letters, spans 1,000 years and bolsters the idea that far northern ecosystems may play a future role in the balance of planet-warming carbon dioxide that remains in the air. It also strengthens support for an alternative technique for teasing climate data from trees in the far north, sidestepping recent methodological objections from climate skeptics. Members of the Lamont Tree-Ring Lab have traveled repeatedly to Alaska, including the Arctic National Wildlife Refuge this past summer. 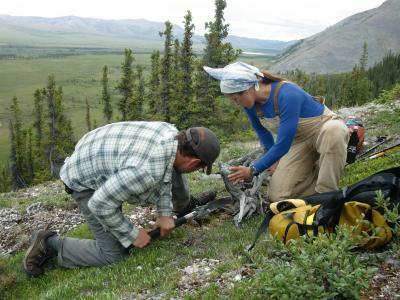 In an area where the northern treeline gives way to open tundra, the scientists removed cores from living white spruces, as well as long-dead partially fossilized trees preserved under the cold conditions. In warm years, trees tend to produce wider, denser rings and in cool years, the rings are typically narrower and less dense. Using this basic idea and samples from a 2002 trip to the refuge, Andreu-Hayles and her colleagues assembled a climate timeline for Alaska’s Firth River region going back to the year 1067. They discovered that both tree-ring width and density shot up starting a hundred years ago, and rose even more after 1950. Their findings match a separate team’s study earlier this year that used satellite imagery and tree rings to also show that trees in this region are growing faster, but that survey extended only to 1982. The outlook may be less favorable for the vast interior forests that ring the Arctic Circle. Satellite images have revealed swaths of brown, dying vegetation and a growing number of catastrophic wildfires in the last decade across parts of interior Alaska, Canada and Russia. Evidence suggests forests elsewhere are struggling, too. In the American West, bark beetles benefitting from milder winters have devastated millions of acres of trees weakened by lack of water. A 2009 study in the journal Science found that mortality rates in once healthy old-growth conifer forests have doubled in the past few decades. Heat and water stress are also affecting some tropical forests already threatened by clear-cutting for farming and development. Another paper in Science recently estimated that the world’s 10 billion acres of forest are now absorbing about a third of carbon emissions, helping to limit carbon dioxide levels and keep the planet cooler than it would be otherwise. There are already signs that the treeline is pushing north, and if this continues, northern ecosystems will change. Warming temperatures have benefitted not only white spruce, the dominant treeline species in northwestern North America, but also woody deciduous shrubs on the tundra, which have begun shading out other plants as they expand their range. As habitats change, scientists are asking whether insects, migratory songbirds, caribou and other animals that have evolved to exploit the tundra environment will adapt. “Some of these changes will be ecologically beneficial, but others may not,” said Natalie Boelman, an ecologist at Lamont-Doherty who is studying the effects of climate change in the Alaskan tundra. In another finding, the study strengthens scientists’ ability to use tree rings to measure past climate. Since about 1950, tree ring widths in some northern locations have stopped varying in tandem with temperature, even though modern instruments confirm that temperatures are on a steady rise. As scientists looked for ways to get around the problem, critics of modern climate science dismissed the tree ring data as unreliable and accused scientists of cooking up tricks to support the theory of global warming. The accusations came to a head when stolen mails discussing the discrepancy between tree-ring records and actual temperatures came to light during the so-called “Climategate” episode of 2009-10. The fact that temperatures were rising was never really in dispute among scientists, who had thermometers as well as tree rings to confirm the trend. But still scientists struggled with how to correct for the so-called “divergence problem.” The present study adds support for another proxy for tree growth: ring density. Trees tend to produce cells with thicker walls at the end of the growing season, forming a dark band of dense wood. While tree-ring width in some places stops correlating with temperature after 1950, possibly due to moisture stress or changes in seasonality due to warming, tree ring density at the site studied continues to track temperature. “This is methodologically a big leap forward that will allow scientists to go back to sites sampled in the past and fill in the gaps,” said Glenn Juday, a forest ecologist at University of Alaska, Fairbanks, who was not involved in the study. The researchers plan to return to Alaska and other northern forest locations to improve geographical coverage and get more recent records from some sites. They are also investigating the use of stable isotopes to extract climate information from tree rings. Other authors of the study include Rosanne D’Arrigo, Lamont-Doherty; Pieter Beck and Scott Goetz, Woods Hole Research Center and David Frank, Swiss Federal Research Institute.